When Hurricane Harvey hit the Southeast Texas region in August 2017, it destroyed and flooded thousands of homes and businesses. With such impact, then, it should come as no surprise that it also greatly affected both the federal and state criminal justice systems throughout the region. 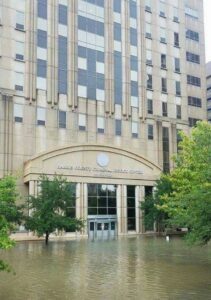 This is the Harris County Criminal Justice Center a day after the rain stopped coming down. The massive flooding caused the Buffalo Bayou, located two blocks from the building, to come out of its banks and flood the northern edge of downtown Houston. Although the building was improved after Tropical Storm Allison in 2001 to prevent water damage, including the installation of flood doors (which can be seen directly behind the front, glass doors), water was still able to permeate the building’s basement causing severe damage. This lead to sewage backing up and coming out of toilets and water fountains on the upper floors. There was also damage to upper floors from cooling pipes bursting from unregulated pressure. The building contained 22 criminal district felony courts, 16 criminal county misdemeanor courts, the District Attorney’s Office, the Public Defender’s Office, the Office of Pretrial Services, and Court Administration. Now it is empty. All occupants were required to move out as the building will have to undergo massive repairs that are expected to take 9 months (but we all expect to take about 18). While the locations for these courts have changed, so to have the times. For many to able to jointly occupy one space, courts have had to move their daily dockets from the typical morning times of 8:30 or 9:00 a.m. to afternoon times like 12:#0 p.m. or 1:00 p.m. It is important to check the schedules referred to above to see what time your court meets at. Harris County has not been the only one affected. Federal courthouses for the Southern District of Texas, Houston, Galveston, Victoria, and Corpus Christi Divisions were all affected, as well as courthouses for the Eastern District of Texas, Beaumont Division. For instance, the Houston federal courthouse was closed until Sept. 5. The Beaumont federal courthouse recently re-opened September 18. State courthouses up and down the Gulf coast were also affected. One of the most frequently asked questions by clients is, “Do I really need to go to court?” As many who are faced with going through the criminal justice system know, court appearances for both trial and non-trial settings are regular occurrences. While these provide crucial opportunities for your attorney to meet with the prosecutors and take up any necessary matters with the courts, there is little expected of the client other than to show up and sit and wait. Fortunately many courts are understanding but communication and relationships are the key. 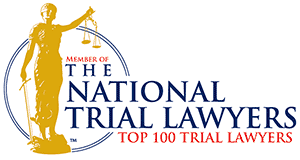 The courts and bonding companies have stressed the importance of keeping in contact with your attorney. In the several weeks that followed the storm and its impact, Brent Mayr was personally in contact with each of his clients to insure they were safe and, more importantly, to assure them that whatever impact the storm and its toll had on each individual’s case, he would keep them in constant contact and informed about any developments. Brent was then able to communicate with court staff and prosecutors to reschedule court appearances without the client having to actually appear. In addition to its impact of the criminal justice system infrastructure, Hurricane Harvey, by affecting people all over the area, has also impacted the criminal justice system by impacting the ability to summons jurors to hear trials. In Harris County, the Jury Assembly room was also completely flooded. Jury duty was cancelled through September 22 and it is entirely possible that it may take longer before the District Clerk is able to summons jurors. Then, with the shuffling of court locations, there is also the problem of where to hold a jury trial. While courts have temporary locations, closing a courtroom to hold a trial not only affects that one court, but several others. While personnel work to address these problem, clients need to be prepared to wait even longer before their cases go to trial. While individuals are afforded a constitutional right to a speedy trial, the courts have always taken into consideration factors that lead to “excusable delay.” These circumstances created by the storm’s impact will undoubtedly be considered just cause. Also what must be taken into consideration is the need to prioritize who goes to trial: those being held in custody awaiting trial will take precedence over those who are released on bond. Precedence is also given to cases with child victims and witnesses whose availability is limited. There is no doubt that Hurricane Harvey has impacted the lives of millions of people. For those going through the criminal justice system, they too will feel the impact of the storm on the handling of their case.